Pinnacle Peptides is a trusted supplier of T4 for all your research ventures. 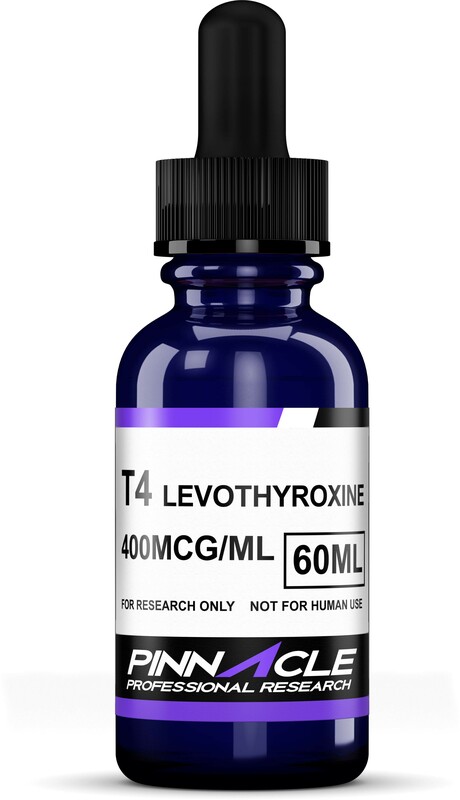 It is also called as L-Thyroxine and it is an iodine containing peptide hormone that is produced from thyroglobulin in the thyroid follicular cells. It stimulates the body metabolic rate and also promotes the growth and development of the human body. For the production of T3 and T4, Iodine is essential. When there is a deficiency of Iodine, it leads to decreased production of T3 and T4, which in turn causes the disease called goiter. The functions of this peptide hormone includes activities like increase in basal metabolic rate, affecting protein synthesis, regulate bone growth, proper development and differentiation of all cells, regulate protein, fat, and carbohydrate and vitamin metabolism etc. It also leads to heat generation in humans. Don’t settle for anything less than 99% pure peptides. With Pinnacle Peptides, you’re always ensured of the highest quality T4 at all times. Due to all these applications of T4, it is in huge demand by various research teams. Studies are being conducted and this peptide hormone is being investigated in detail to know more about its applications in pharmaceutical industry, cosmetic industry, body building industry etc. It is also used as a skin care component in creams etc., and since it acts like a steroid, it is of interest to the body building industry too. It is also used in the treatment of various disorders related to growth and neurodegenerative problems. When you buy T4 for research activities, make sure to procure it from a reliable supplier source. Pinnacle Peptides strives to offer nothing but the best to the customers. High quality and purity of the research supply is essential to conduct researches which lead to accurate results. Contaminations may result in reducing the quality of the research. Pinnacle Peptides are an online peptide manufacturer who offers high quality products at attractive prices along with additional facilities. These facilities may include domestic and international shipping services etc. Do not use the research peptide for any other purpose other than research activities. It is not suitable for direct human consumption. T4 is an investigational peptide, still in the experimental stage for usage in treatments etc, but it is hugely popular and in demand due to its immense potential in diverse applications. Have a look at Pinnacle Peptides’ inventory to fill all your research supplies. The products we offer are intended for laboratory research use only. In purchasing any of these items, the customer acknowledges that there are risks involved with consumption or distribution of these products. These chemicals are NOT intended to use as food additives, drugs, cosmetics, household chemicals or other inappropriate applications. The listing of a material on this site does not constitute a license to its use in infringement of any patent. All of the products will be handled only by qualified and properly trained professionals. All customers represent and warrant that through their own review and study that they are fully aware and knowledgeable about the following: Government regulations regarding the use of and exposure to all products. The health and safety hazards associated with the handling of the products they purchase. The necessity of adequately warning of the health and safety hazards associated with any products. Pinnacle Peptides and www.pinnaclepeptides.com reserves the right to limit and/or deny sales of products to any unqualified individuals if we have reason to believe that misuse will occur.